How to Identify a Copperhead Snake: What You Need To Know? A friend once told me that when I go outside, I will see the breathtaking wonders of nature. But, I should also know that the world out there is not just yours – it belongs to many other creatures. Some of them are snakes, and I must take additional care when going for a hike or camping trip. So, now I am going to talk about one commonly misidentified wildlife denizen and help you How to Identify a Copperhead Snake? How to Identify a Baby Copperhead? 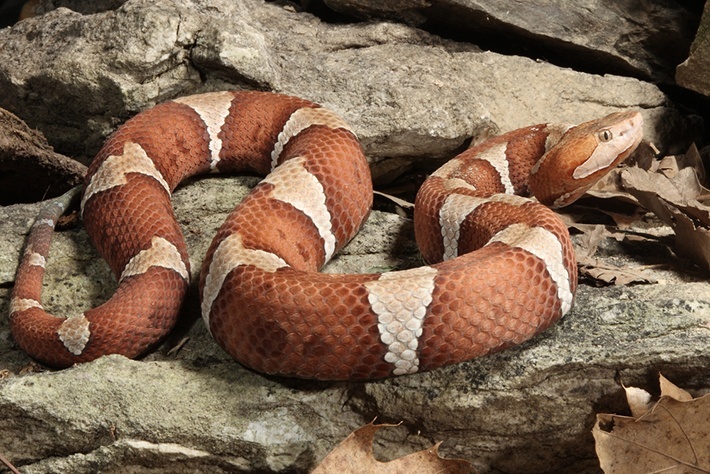 There is no doubt - the copperhead snakes got their name because of the copper red head color, but there are also other snakes with the copperhead attribute in the name, but different common name. Other copperhead snakes are Australian copperheads, radiated rat snakes, and Water Moccasins but they aren’t similar to North American copperhead snakes. ​These snakes live throughout the United States, and their natural environment usually consists of rock outcroppings and forests, but they also like to visit swampy areas and lowlands. 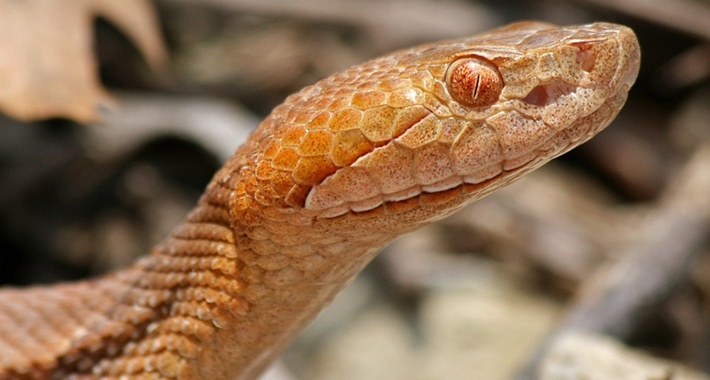 Like any other snakes, the copperheads are poisonous ones. Between the eyes and nostrils, these snakes have a pair of pits which gives them the ability to view their prey in infrared. Therefore, they are also called pit vipers like many other snakes species around the world. The next thing about what I should warn you is - when outdoor walking or camping, there will be a chance that you won’t be aware of the copperhead presence. Yes, the copperhead snakes are masters of camouflage, and you won’t see them easily. These masters of disguise are only hibernating during the winter, but through the rest of the year, they are active. Further, you must know that copperhead snake won’t flee when you come near but rather freeze and wait for your next move. Smart, right? And if you somehow disturb the copperhead during the resting time or hunt, it will bite you with such a speed that you won’t see it coming. The copperhead snakes are holding the record of the highest bit rate in the United States with over 55000 bites per year. On the other hand, their venom is considered to be the least potent in the North America, and for over a hundred of years there was only a handful of deaths across the States. That said, the following text is here to help you How to Identify a Copperhead Snake, and what to do when you meet one. The average length of the copperhead is 2 to 3 feet which make them the medium size snakes. Their body is enormous and thick, as it is of the other pit vipers across the United States. So, if you are looking at the snake that has a slender body it probably isn’t copperhead. 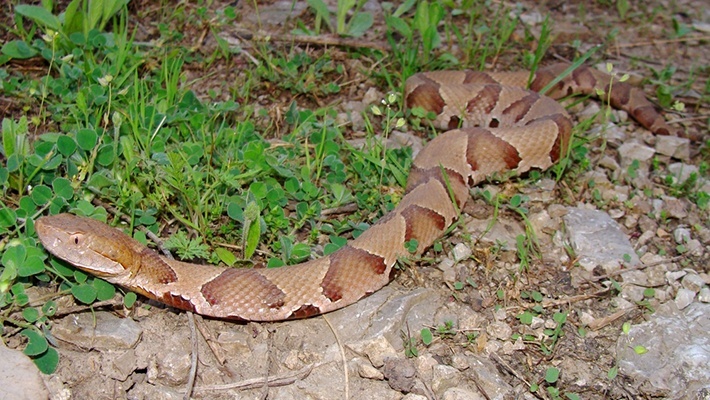 Next, the head of the copperhead is broad and flat with triangle, diamond or heart shape – call it is you want. But, the overall shape of the head look is usually not enough for you to determine if it is copperhead that you came across since there are many other snakes with similar heads. So, the feature to consider is the color of the body. The camouflage color pattern of the body makes the copperhead snake almost invisible when it rests among the dead leaves. So, the color of the body is usually brown or ruddy orange but even the pale tan or brown-green color. The lighter base color has irregular patterns which have the particular hourglass look. When you look at the eyes of the copperhead snake, you will see that the pupils are similar to the cat’s pupils as they are vertical. The color of the irises can be orange, tan or something like red-brown. Thus, for obvious reasons, it is safe and better not to explore how lucky you are and check the color of the eyes from close. The snake needs, love and protect its space, so you should be on your way to another direction. 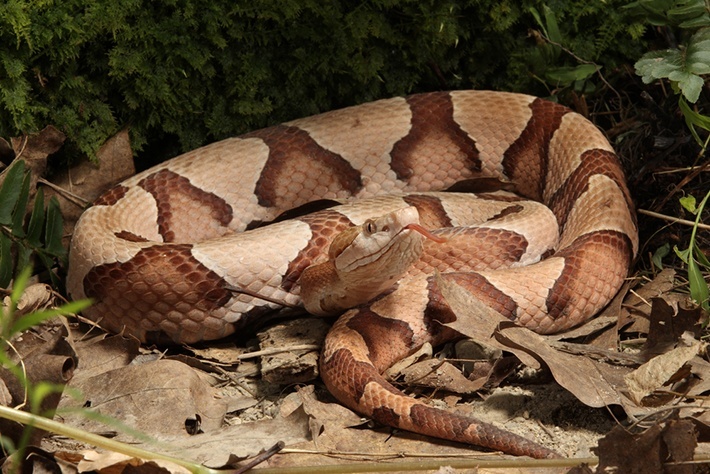 The copperhead snake is not the aggressive one, but their moody behavior comes with sudden and quick bite, or it will vibrate with the tail and release the strong smell which is a clear sign that she wants to be left alone. But, be sure that if you cross the line when you wittingly disturb the copperhead, it will become very aggressive. No one, not even the snake likes to be bothered with rude behavior. It 's nice to know that young copperhead snakes have the same color pattern as the adult ones, but the color of the tail is something that differs them. The yellow tip of the tail becomes darker as the snake grows up. 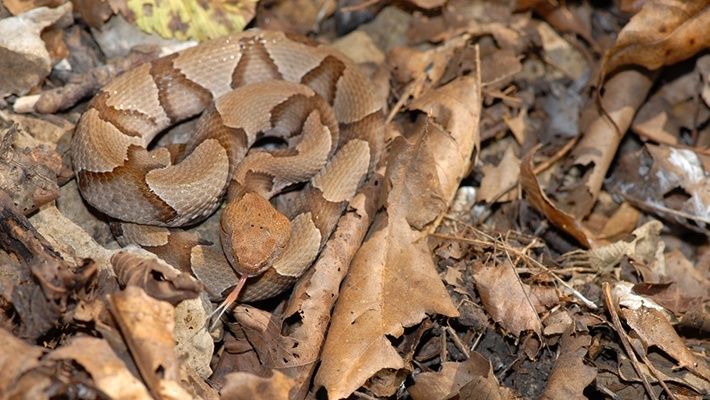 Usually, the young copperhead would disguise the tip of the tail among the leaves and attract insects, lizards or frogs. The need for hunt also increases as they mature. There will be no camouflage pattern on the head. As I’ve said, the color of the head is copper red. On the young snakes, the color of the eyes is something like intense gray color, but all other features and attributes are same as the older ones. The presence of the snake makes us feel uncomfortable, right? Well, the truth is that the snake thinks the same about us. They don’t want to be around us on the same way we don’t want to be near them – it is simple as it sounds. So, if you meet the copperhead snake somewhere outdoor, just let her be where she is and give her space. There is no need to disturb her because she will probably leave as soon she is aware of your presence. On the other hand, if you see copperhead in your backyard know that she will hunt down any vermin with more efficiency than the cat. Finally, for removing the copperhead snake from your property ask for the professional help. The largest amount of copperhead snakebite comes when people try to catch or kill her. Here you can discover more about what you must do if you get bit by a copperhead snake. Now it is time to repeat what you have learned from this text. The copperhead snake is beautiful, shy and sometimes moody creature that will require from you to have respect for its personal space. The best thing that you can do is to simply be aware where you step and if you meet one to let her do the daily business. 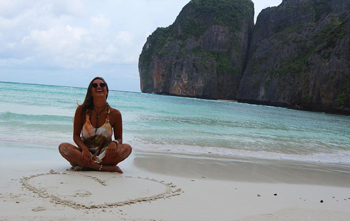 The world is big enough for all of us, and as soon we start to care about all of the creation this planet will be one step closer to perfection. Finally, I will provide you with a summary on how to identify the copperhead snake. Thick, stout body with a flat triangle head. The color of the head is copper red. The tail is light yellow on the young and dark brown on the mature copperhead snake. The hourglass camouflage pattern on the body. 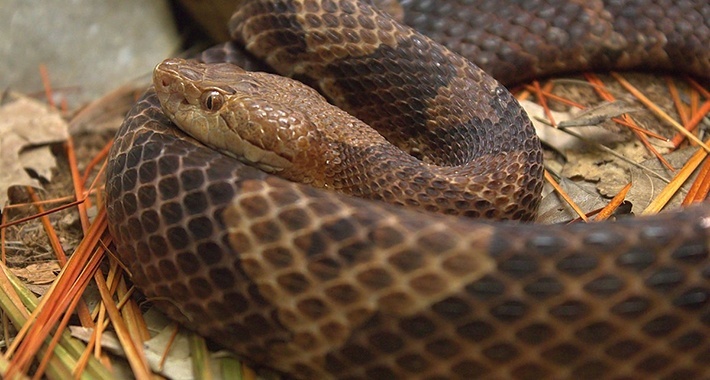 The copperhead snake has slit pupils. When disturbed, the tail vibrates and releases the strong smell.